It’s been a week of needles… On Monday I went to see the Osteopath again. Chris found a particularly tender spot, the most painful yet, at the bottom of my spine, to the right. Same area the scan, from 3 years ago, noted some desiccation.. So he worked on that and some tight spots along my back. And then put some needles at that tender spot for a few minutes. When I left I had to walk very slowly home, the whole area felt weak. I laid down on the couch and fell asleep at 6pm until my husband got home. I felt exhausted. I was told not to exercise that evening, so I had to miss capoeira. So my back is still achy but I think he found the source of the pain I’ve had in recent months, which is on top of the general back ache I’ve grown accustomed to since my early 30s. This particular pain is new and more intense and I hope we are on the right lines with it. He’s also treating my right gluteus area, as that’s been a problem in recent times too. All on the right hand side… (Except for my knee injury in September, but I fixed that one myself with ice/rest/support band/acuptuncture/self massage, which I still do). And on to today and my right arm/shoulder. I can’t remember a specific incident that may have caused it, I think it may have been the fact that I was doing more pushups than I used to (was building up to 20+, with legs straight), combined with using the mouse all day (the classic inactivity then too much activity syndrome)… So the last few months have meant I only get about 60% strength on that arm, whenever I lift something it aggravates it, and there have been no real push ups for sometime. Interestingly I can do pull ups on a bar, but I’ve never been able to do many! But my arm doesn’t collapse when I do them like it has been doing when I come back up from push ups. Got to St. George’s at 13:30, was explained the risks – the only worrying thing was the possibility of anaphylactic shock, but that didn’t happen, it doesn’t happen in most cases, obviously. What did happen was it hurt like hell. The injection was inserted at the top of my shoulder. She said a little scratch but it was a lot more that that. Only lasted about 10 seconds though. I felt a bit odd, probably the shock and adrenaline from the pain, so she laid me down with my legs above my head. Once I sat up again, and had some water, she asked me to do the arm movement where I feel pain (basically lifting it up above shoulder level). The pain was still there, but fainter. But this can take a week or two to settle, so we just will wait and see. I thought I was getting a guided injection (as I was told there would be two people there, in the end there was only a woman) – but this was a ‘blind’ one. She said if this doesn’t work the next step is ultrasound. Why not do that in the first place? Cheaper to inject someone blindly on the arm I suspect. I to had partially walk home with the bike (St George’s is 20 min walk away from my house), but then I got bored and cycled using only one hand to guide the bike (I was told cycling was a bad idea), the act of holding the handle puts stress on it and you are supposed to have 2 days complete rest after injection. Also also I can’t do any form of vigorous exercise that is arm impacting for a week (cycling should be ok after two days)! I already missed capoeira on Monday, and I will miss it this evening too, and I guess Saturday is out of the equation as well. Will have to run/walk for next week to get my fix. Will not cycle until Tuesday. Better give it as much of a chance to fix itself as I can. I never got back to give an update on the injection. It did fix the issue, and it’s nearly two years later, haven’t had any issues since. Had cortisone injection on right shoulder, with Dr Mark Jeffery @ Parkside Hospital. This one hurt A LOT LESS than the one given at St. George’s as it gave it from a different position. 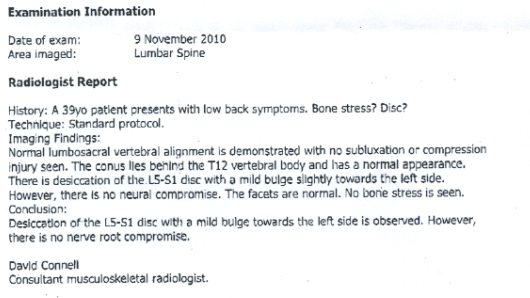 This time I also had an ultrasound where I could actually see the impingement. 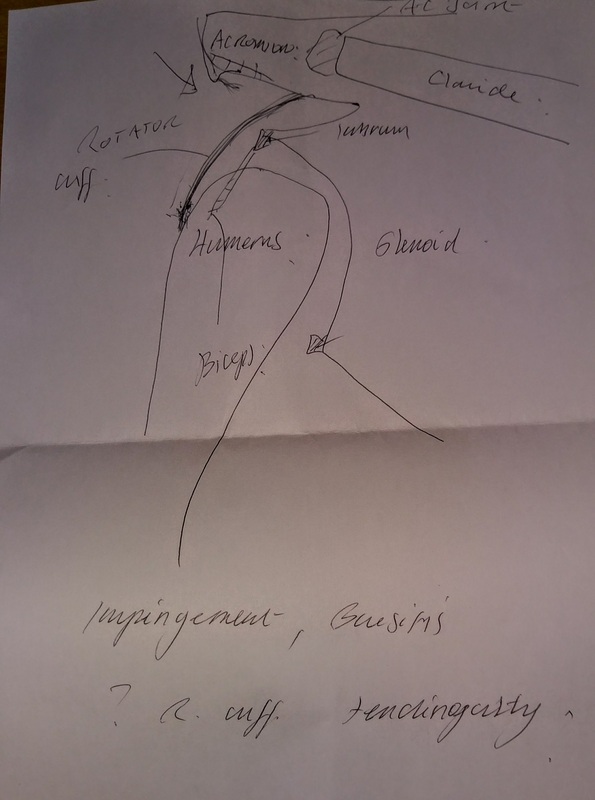 Impingement, bursitis, rotator cuff tendinopathy as drawn by the specialist. It took about 2 months after the injection for my shoulder to stop hurting and to feel the strength coming back – I was doing T25 with weights (Beta and Gamma) at home to strengthen the muscles around the area. I had a single private physio session but didn’t like the guy very much as he was treating me as if I was an elderly person! Note the St. George’s painful injection worked a lot more quickly, in two weeks. Maybe it taking 2 months means it never worked and the issue improved with exercise? Who knows, I never went back to see the specialist, Mark Jeffery at Parkside Hospital. I’ve had a back and knee issue since then and I just massaged them at home myself. The more injuries you get the more you learn to deal with them yourself! Unless, of course it’s something more serious.